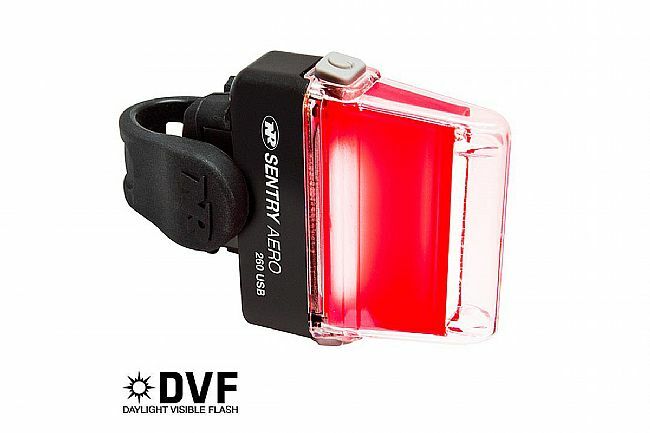 NiteRider's Sentry Aero 260 Rear Light is USB rechargeable, featuring an innovative aero shape with powerful side visibility, water-resistant construction, and 2 light levels and two flash modes that max out at an ultra-bright 260 lumens in Daylight Visible Flash Mode. Includes: Tail Light, Easy on/off Seatpost Strap Mount, and USB Charging Cable. I purchased this rear light because I have had good luck with Nite Rider products previously and I needed a new rear light on my commuter bike. I particularly like the fact that it is visible from the sides much more than most lights. Several different blink modes. I like the one that modulates more than strobes. Very secure mount that is still easy to get on and off fast. An added bonus is that it is also daytime visible. I've had it for a couple of months now and use it on my daily commute. It is good for 3-4 hours at least, but I can just bring it in to work and plug it into the USB on my desktop if I need a quick charge. Light is awesome from the view point of visibility. Definitely one of the more visible lights amongst the group I ride. Has a slight drawback in that you have to remove the entire light when you go to recharge and requires recharging after each ride. Granted our rides are three hours in which it does hold the charge without fail. This is a super bright blinking light. Even in daylight I cannot even stare at it without getting blind. And its affordable. Very bright but the battery did not last more than 2 hours.